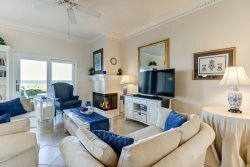 Located on the quiet and beautiful Amelia Island, our two bedroom condo is the perfect place for a family vacation or a couple's getaway. Recently renovated with top-notch amenities, you'll relax in luxury when you're not basking on the beautiful beach or golfing at one of the many world-class courses nearby. This two-bedroom luxury penthouse is located on the 7th floor. It includes stone finished bathrooms, wood and stone floors and plenty of comfortable leather furniture. But the best part is the outdoor balcony which overlooks the beach and a lovely view south down the Amelia Island coast. 2BR/2BA Penthouse unit. The master bedroom is off the living area with sliding glass doors leading out to the oceanfront balcony. Your 4 poster Queen bed makes you want to just curl up in the morning and watch the beautiful sunrise and the master bath has a wonderful walk-in shower for that relaxing shower. The Queen guest bedroom has a view of the sunset over the tree tops and a newly updated tub/shower in the guest bath. Book your stay today with Amelia Rentals and let us help you make lasting memories. THIS UNIT ALLOWS 1 PARKING PASS ONLY!! !